A second generation Yamashiro the Nobukuni from Nambokucho period, working during the brief period of the southern court. 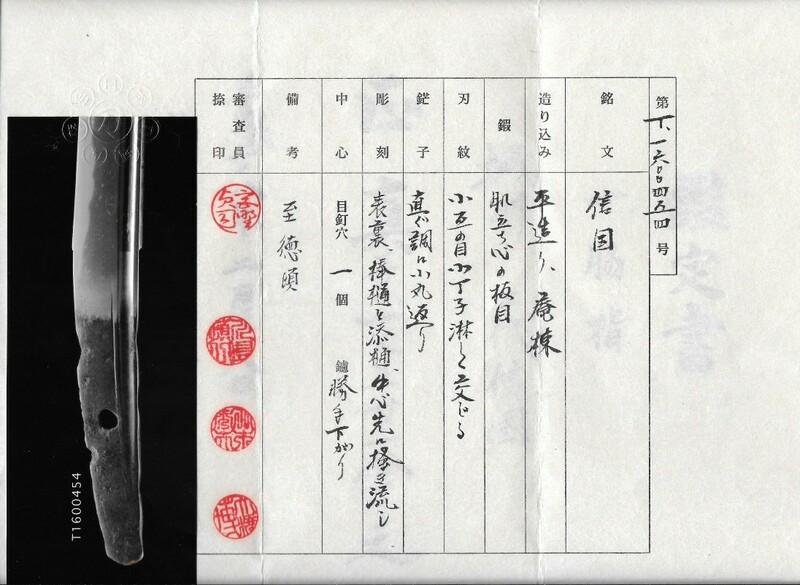 Signed, nijimei Nobukuni. Hawatare: 1 shaku 3 sun 2 bu (40 cm / 15.74"). Motohaba: 2.58 cm. Kasane: 4.3 mm. Hirazukure, toriizori, mitsumune, bo hi & futatsubi. Nie deki ko-gunome choji midare, ha nie, long kinsuji, nijuba, nado. Ko-mokume hada, jinie, chikei, utsure, nado. Sharpness rating of Wazamono. Black lacquer saya,. Black tsukamaki, shakudo nanako fuchi-kashira with vines and kirimon in takazogan. Unusual triple kirimon menuki, with nanako, that appear to be solid gold. Aoegata tsuba with a gilt mimi, nanako plate decorated with vines and gilt kirimon in takazogan. 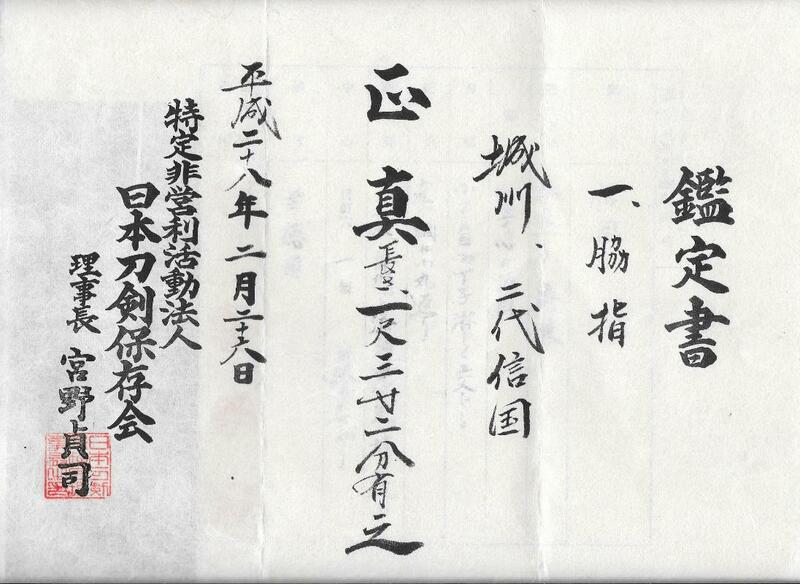 This is the Heianjo Nobukuni, the same as Sadakuni, Hawley N301 (90 points). He is not illustrated in Fujishiro, but is rated at 7,000,000 in Toku Taikan by Tokuno. He worked during Shitoku (1384-1387) and Enbun (1356-1361). As of 2000 there were 95 Nobukuni juyo. Unfortunately, there is no differentiation between most of the smiths in the list of juyo blades. The nearly twenty dated pieces tend to be later, many Oei (1396). NTHK-NPO kanteisho. NOT FOR SALE.